After switching my coffee storage from the VacuVins to the Airscape cannisters, I was STILL not satisfied with the freshness of my coffee. And it's not so much that I was dissatisfied with the Airscapes - they ARE better by a longshot than the VacuVins. Both the Airscapes, made by Planetary Design, and the very similar Prepara EVAK containers work far better than a regular crock, jar, or any air-tight storage container, especially if you don't consume a jar's worth of beans in 3 or 4 days. The lid slides down inside the container, shrinking the size of the container with the decreasing amounts of coffee, thereby helping to limit exposure to O2. And they are FAR more convenient in day-to-day use than the VacuVins. But, the air filling the spaces between the beans is still there. And every time you brew coffee, the canisters must by necessity be opened and closed, which allows even more air and humidity to get to the beans, even if it's for a short time. So the Airscapes as the sole method of storage, only caused modest improvements in how long my coffee stayed fresh. On the other hand, the Airscapes used in combination with vacuum-sealing the beans, helped enormously. So now, I store ONLY the amount of coffee I'll use within the next few days the Airscapes. That's only about 3 ounces (85 grams) of coffee, so I use the smallest size containers. Using this method, my coffee stays in pretty good shape for a full month. 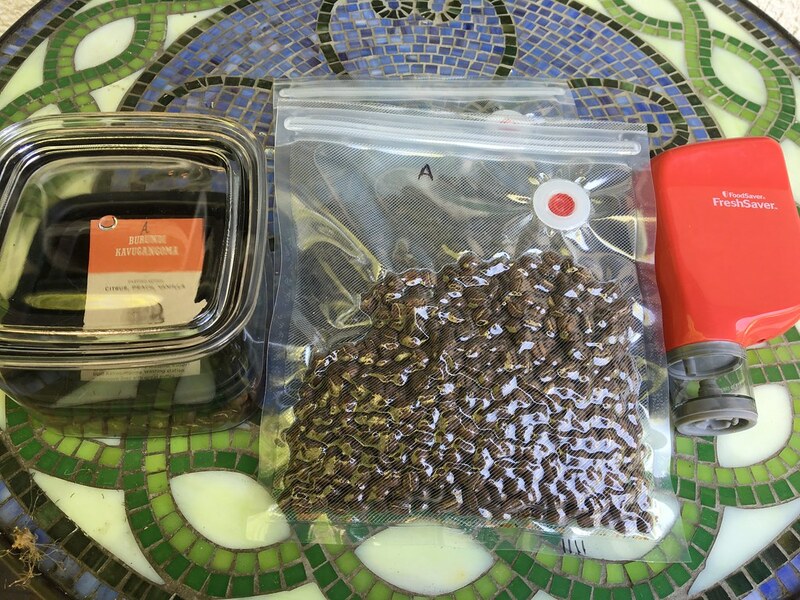 I vacuum pack the rest of the beans in 3-ounce/85 gram increments. 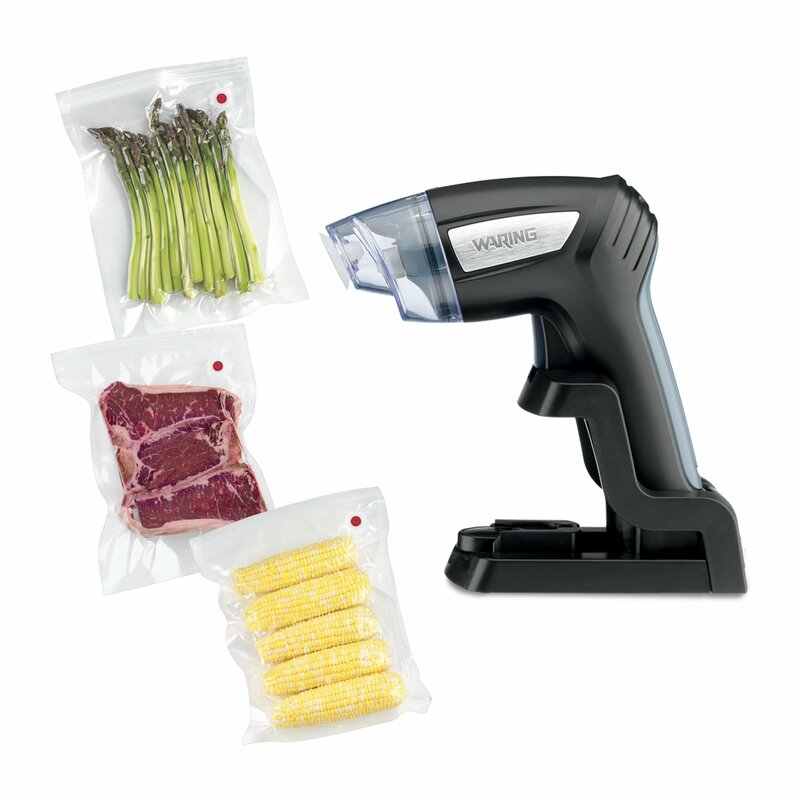 I don't use the big, Foodsaver-type vacuum-sealers, as I don't like the amount of plastic waste, plus I find the big units inconvenient, cumbersome, and a pain to store. Instead, I bought 3 kinds of resealable vacuum-storage bags to test. Basically they are Ziploc-type bags with a vacuum-sealing valve in one corner. You use a hand-held vacuum pump to remove the air, after you sealed the bag seal across the top. Ziploc: These are completely unreliable, and basically single-use bags, as they wouldn't stay in a tightly-vacuumed brick. I was only rarely able to get a second use out of the bags, even avoiding both hand washing or dishwasher cleaning. Not a green choice at all, since you couldn't re-use them, and even though they are cheapest per bag, they end up being the most expensive option. ($0.45/bag and $0.45/use). I'm glad I have the little hand-pump though - it's handy. Bags NOT recommended. 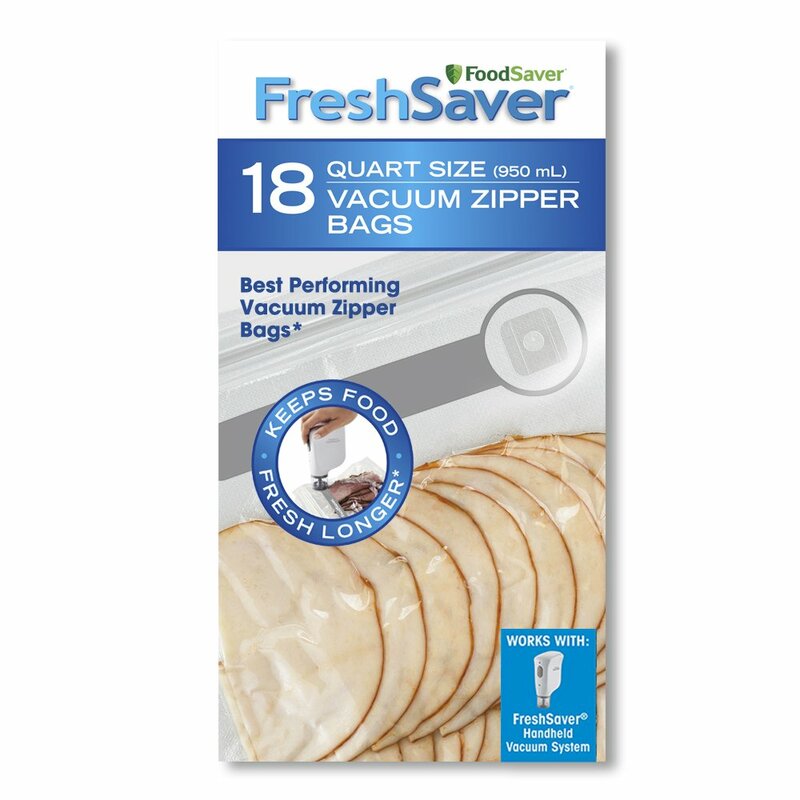 Freshsaver: These have the same kind of valve as the Ziplocs, and are a little better - I was usually able to get 2 or occasionally 3 uses before they stopped holding a seal. But, even though they they are more expensive per bag, they end up being less expensive on a per-use basis. ($0.69/bag or $0.28/use at 2.5 uses). NOT recommended. Waring Pro: These are MUCH more expensive, have a different kind of valve, and are made of a much heavier-duty plastic. They are also very reliable, if you don't put them in the dishwasher, and either don't wash them, or only wipe them down and let them dry. I've gotten 20+ uses out of them (I tossed that batch, not because they had gotten unreliable, but because I'd run out of writing space on the outside of the bag, and wanted to start over with a different, simpler labeling system). I've read that it's not unusual to get more than 50 uses ($0.80/bag). But because I've not gotten any bags to 50 uses (yet), lets use the more conservative 30 uses to calculate the per use cost: ($0.03 per use, but it could be much cheaper than that). RECOMMENDED. At the time, it was about $75, more than 3 times more expensive than the next cheaper option. It can't be used while it was plugged in. The battery died MUCH too quickly according to many, many reviews. So, once the battery died, the unit was rendered useless (because it can't be used while it's plugged in), and the battery isn't easily replaceable. The Freshsaver pump was less than $20, and COULD be used while plugged in. Note: if you use either the Freshsaver pump or the Ziploc pump (I have both), and you find that you have trouble getting a good seal against the valve, wipe the rubber gasket around the mouth of pump with a damp dishcloth, to remove any grit/dust that has collected on it, as it prevents the pump from sealing around the valve.